Our machine quilting tips will help you get off to a good start when you begin to machine quilt on a regular sewing machine. Don't become discouraged if your machine quilting stitches aren't quite 'perfect' when you begin because most new skills take practice, and that's certainly true of machine quilting. Begin with straight line machine quilting, sewn with a walking foot. That method is easy to learn and it won't be long until you branch out into freehand techniques. Learn more about machine quilting options before you begin your first project. When you choose needle for machine quilting, consider the thickness of your batting and fabrics as well as the intersecting seams on your quilt top. Intersecting seams tend to add more layers for the needle to penetrate. Use a leftover quilt block, batting, and backing (all similar to the fabrics in your project) to make a practice quilt sandwich. Try out a size 80/12, size 90/14, or a size 100/16 needle. Notice how easy, or difficult, it is to stitch. Change needles to find out if a new size improves the stitches. Pay attention to the size of the hole the needle leaves in the fabric, and whether the quilting thread you use is passing easily through the needle. Try the same setup in your actual quilt once you're satisfied with all aspects of the practice piece. If your quilting thread keeps breaking, check your sewing machine tension or change the needle -- some needles have burrs that cannot be seen. Make sure you're using a thread that's suitable for machine quilting. The thread might also break because it is too dry. Resolve this by applying a silicone lubricant found in the notions section of your fabric store or try placing the thread in a baggie and putting it in the freezer for an hour. Work from the center out on your quilt to avoid bunching and puckers on the top fabric and the quilt backing. The center-outwards method includes most quilt basting methods. Moving your quilt during machine quilting is easier on your hands and arms if you wear a pair of machine quilting gloves. The gloves are made with little rubber nubs on the palms and fingers so that your hands can maintain an easy grip on the quilt. Quilt stores usually stock the gloves. Take regular breaks while you machine quilt. Stretch and stay hydrated to help reduce fatigue. Remember to relax while machine quilting and try not to keep your shoulders in a hunched position for long periods of time. An easy way to program your brain with a freehand machine quilting design is to draw the design on pieces of paper over and over again before you try practicing the design on fabric. 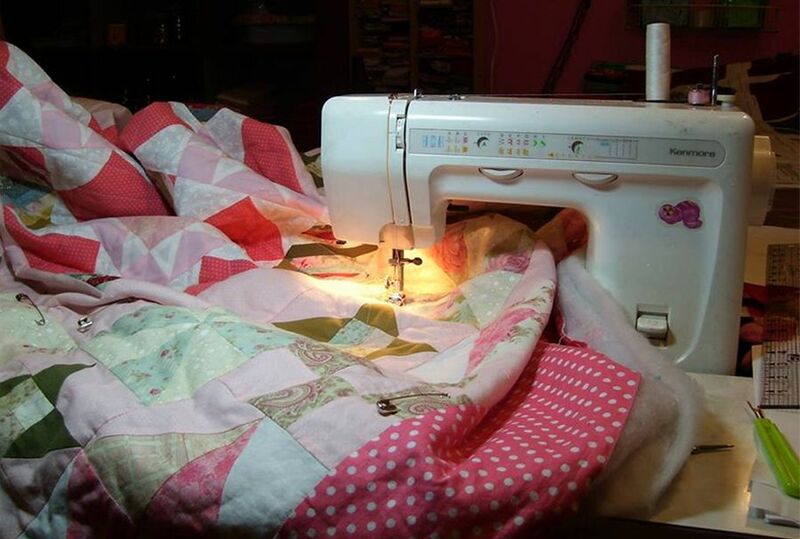 When quilting a large quilt on your sewing machine, position a table behind your machine to help hold the weight of the quilt. Otherwise, the weight will create drag as it falls to the floor, causing you to work harder to place the stitches exactly where they should be. Positioning the quilt on your shoulder as you feed it under your needle also helps reduce the drag.